We laughed, we cried, we empathised. 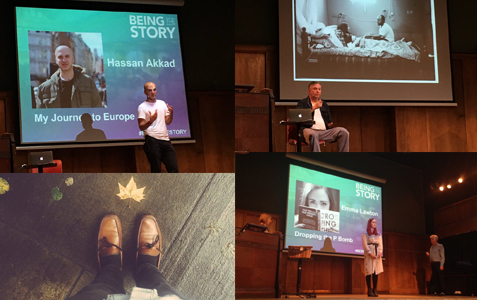 Yesterday’s Being the Story event, curated and organised by Jude Habib of SoundDelivery was a showcase for stories. It wasn’t a traditional charity conference. There was no mention of digital comms channels, no talk of impact measurement. We shimmyed our pom poms, we boxed, we walked in other people’s shoes and sang. But most of all we heard people’s stories, told first hand. It was moving and powerful and upsetting and inspiring. It was all about the experience. The Micro Rainbow International Interfaith Choir. The stories they told were amazing. But more than that, it was how they were told. Hearing directly from someone in the same room, is very powerful. In some cases the delivery was a performance. Watching Emma Lawton peg visual representations of the things that had happened to her, then cut the piece of string held by her parents was one of the most moving things I have seen. It brought the house down. First-hand stories are powerful. You might think you are doing this already through your case studies. But it is not the same. This is about creating a platform and a culture where people want to share their stories for you. They are the ambassadors for your cause, not your charity. They help people to understand and empathise about the condition / experience which helps to inspire someone to help do something about it (through donating / volunteering etc). How to harness this is crucial. The strongest channel must be the in-person delivery. The top of the comms pyramid is the opportunity to be listened to for 20 minutes with no distractions. How could you not be affected? There are other examples which come close. The audio / shoe experience from the Empathy Museum connects sound with something physical. The WeAreHere installation in June bought the stories of WW1 soldiers to life. There must also be examples of individual storytelling using Virtual Reality. These are all about intimacy and experience. By sharing an experience we can feel empathy. Can this be done in other ways? Watching a video of that person is good but not the same as in-person delivery. You have to be so engaging that the hovering swipping finger stays still until the end. Can you distill someone’s story into 140 characters, a written case study or blog post? It is of course possible but is it enough? Maybe it depends on the complexity of the story? There are some organisations doing this. 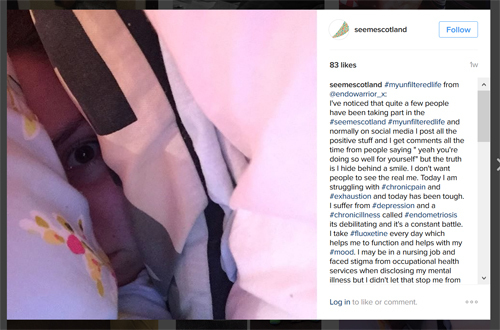 For example SeeMeScotland’s recent #myunfilteredlife campaign where people have been sharing images on instagram with many saying ‘I don’t usually join in with social media shared like this’. An intimate picture and powerful words, directly from the person helps us to share the experience. There are organisations who have expert ambassadors who publicly talk, for example CoppaFeel’s founder Kris Hallenga who was the highlight of one Media Trust conference and the Expert Citizens programme. Emma Lawton is herself an ambassador for Parkinson’s UK. And many organisations have beneficiaries who speak to the media. SoundDelivery’s mission has been to help organisations collect and use the stories of the people they work with. They understand the power of putting on a pair of headphones, listening to someone speak and sharing someone’s world. The question for us all as charity comms people is how to find and share the authentic voices. Whether you take inspiration from Emma Lawton’s performance or ideas from the Empathy Museum, now is the time to be creative. Now is the time to find ways to put empathy rather than sympathy at the heart of your comms. Being the Story – from Dorset to London. Spotted any first-hand stories? Do share them in the comments. This week I read this story in the Metro Online for World Alzheimer’s Day – My nan’s dementia and me. Being the Story 2017 – cathartic and powerful storytelling. Being the Story 2018 – Go outside your echo chamber, it is where the reward is. See you at the next Being the Story? This entry was posted in Storytelling and tagged authentic voices, CoppaFeel, Empathy Museum, Expert Citizens, Parkinson's UK, SeeMeScotland, sounddelivery, Storytelling. Bookmark the permalink.